Earlier this year we shared a blog about the successes that The Animal Rescue League of Iowa and their Pit Crew have accomplished on behalf of “pit bull” dogs and their people. In reflecting on their successes and how times have changes, ARL has decided to end their “pit bull” specific programs in order to fully assimilate “pit bull” dogs into the general shelter population. We think this is an excellent indicator of the evolution of “pit bull” dog adoptions – the times are changing and for the better! Please take a moment to read their well written post about how they came to this decision. Note that all of the services and outreach that they are doing now will continue. However, their efforts are being rebranded to focus on ALL dogs, rather than “pit bull” dogs only. IMPORTANT PIT CREW UPDATE: We have made great progress with the Pit Crew & Ambass-A-Bulls over the past 3 years – progress not only in spreading awareness, but also in increasing adoptions – in 2010 when we started the Pit Crew, we had 19 “pit bull” dog adoptions that entire year. From January through August this year we have already adopted 123 “pit bull” dogs. We’ve removed breed bans from 2 cities and are still working with several others. Hundreds of “pit bull” dogs have received free spay/neuter surgeries, microchips, and rabies vaccinations at no charge to their owners who would have otherwise been unable to afford it. We’ve taught nearly 1,000 kids about bullying and stereotypes and how to safely greet a dog of all breeds. “Pit bull” therapy dogs have been in countless nursing homes, libraries, community centers, businesses, and more throughout Central Iowa. Nearly two dozen “pit bull” dogs are now Canine Good Citizens – and there are many others who began enrolling in training programs because they were inspired by the CGC leaders. We’ve met a lot of people and changed a lot of minds. We started the group because we needed to elevate the dogs’ brand in our community. We needed to show that the dogs aren’t what people hear about them in the media, that dog bites are not a breed issue, and that dog fighting is not what the majority of these dogs do. The overwhelming majority of dogs identified as “pit bull” by appearance are actually sweet, family pets who have never been abused and have never hurt anyone. They are just dogs…and dogs are individuals and therefore should be treated accordingly. So we recently have come to a cross-roads. We had a decision to make – do we continue down the path of “Team Pit Bull” where we focus so heavily on “pit bull” dogs that people see them as different? Or do we re-integrate back into the path of “Team Dog” where we show people that “pit bull” dogs are just dogs – and instead, have a strong representation of ALL dogs within this new team? The ARL has chosen the latter. There is a time for awareness programs and “Team Pit Bull” and we all know that Des Moines needed it in a bad way 3 years ago, but that was then. We’ve now grown past that to the point where the approach that was previously our solution, is now becoming our problem. 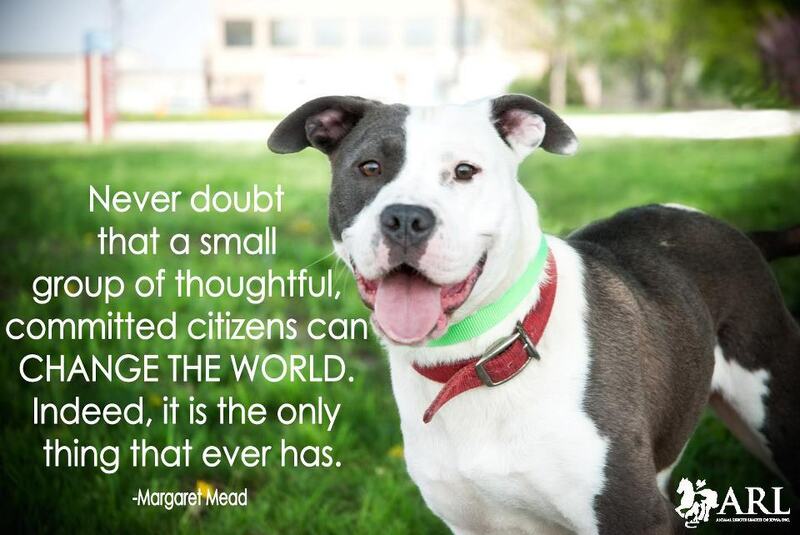 Having programs for “pit bulls” and calling it 1 thing and then having programs for ALL of the other dogs and calling it something else is not going to help forward our mission. We are SO proud of the work we’ve done and everything that we’ve accomplished with your help, but what we’re most proud of is that we have elevated the dogs back on the playing field as equals and now it’s time for the next phase in our journey. We used to have a spay/neuter program for “pit bull” dogs called PitStop and then one for all other dogs called DogSnip. The branding for PitStop has ended and all dog spay/neuters will be promoted as DogSnip. The service has not changed, but the branding has. Likewise, the service of the Pit Crew and Ambass-A-Bulls will not change, but the branding will. We started a variety of programs through this group that were new to the ARL and those will all continue, but under a different brand. The focus of the new Team Dog will continue to be what the Ambass-A-Bulls have been focused on over the past year – primarily in the area of advocacy: Helping cities create safe ordinances for people and pets, identifying and creating pet-friendly housing, and providing public outreach services to undererved communities through our Pets for Life program. We are phasing out our Black Dog and Black Cat clubs for the same reason. This page will soon be merged into the main Animal Rescue League of Iowa page and the content we used to post on this page will now be posted on that one. Well said ARL! We applaud organizations that are taking this progressive step forward in recognition of the changing times. That being said, if your organization is adopting out “pit bull” dogs for the first time and there are no other options, there may be a place for Ambassador (or otherwise “pit bull” dog specific) programs as a temporary bridge from point A (no adoptions) to point B (full inclusion). Used as means for transformation these programs may be helpful in changing public opinions. 1. Is it really necessary? For example, if the public is already on board and adopting your “pit bull” dogs, there’s no need to single them out for special programs! 2. When can we end it? These programs should always be considered to be temporary. Use them only as a transitional step to help change hearts and minds in your community. Do not allow them to become permanent, therefore perpetually singling out “pit bulls” as different than other dogs. With any Ambassador program, the goal is to help adopters, staff, and board members look at “pit bulls” and learn to simply see dogs. For adopters, the intent is to help them consider whether that dog, who happens to be a ”pit bull”, is a good match based on their personality and pet qualities. If you choose to use these programs, consider them just one brief stepping stone along the path to full inclusion in your adoption program. Ambassador Programs are a tool to help start adopting out dogs. But beyond that, the programs can have unintended consequences that make “pit bull” dogs seem different and undesirable or scary, which means the window for having such programs needs to be temporary. Aim for day when all dogs are promoted equally – free of specialized programs or restrictions – and celebrated as individuals! Have a question about ambassador programs? You can visit our website to see how we recommend using them temporarily. All dogs are individuals. Breed has no bearing on the challenges of a dog in the end, since most dogs being adopted are mixed breed. So the only challenge is getting to know that particular dog’s personality and issues if it has any. Most dogs all over the place are not purebred dogs. The only challenges are whether you are a big dog type of dog owner or a small dog type of dog owner. Big dogs need someone who can manage a big dog and all that goes with an energetic dog that can knock you over if you let it. It certainly isn’t the dog’s fault. You know what you are getting into when you adopt a bigger dog. Little dogs have their own challenges. It’s a matter of finding out how committed and realistic a potential adopter may be in finding out the personality of that bigger or little dog and whether they are willing to adjust and manage and take care of that particular animal properly. Respectfully and in support of all the good works your organization has done over the years I’m not in support of this at all. Not all dogs are created equal and many dogs need the opportunity to have someone fully educate possible adopters about that specific breed…whichever breed it might be. There are particular challenges with some of the “pit bull type” dogs; Ambassador dogs and those who dedicate themselves to those programs are still very much needed. Not all dogs can climb to the top of a tree. Not all dogs can crew or force their way out of a crate. Not all dogs can scale a privacy fence with one easy leap. Not all dogs have the same prey drive levels. Not all dogs have the same need to be worked. If you have truly fallen in love with this breed and understand the breed in its full capacity you know very well they are a cut above the rest….and those special traits and characteristics still need to be introduced to those who’s only dog experience might have been with a toy poodle….thank you for allowing my input. This is a topic that’s been on my mind a lot lately: by trying to single them out in a positive light, we are still singling them out! Dogs are dogs are dogs. All individuals and should be treated as such. I think it is wonderful to see this progressive strategizing. Thanks for sharing! Wonderful news. The sooner they are acknowledged as what they all were all along, the better. Individual, wonderful, unique animals, whether they be pit bull type dogs or black dogs or cats, the sooner people will stop thinking of them as different. They were always wonderful dogs and cats. It’s the media and other groups that perpetuated the myth that something was wrong or different about them. Things are getting better for all of them. Celebrate that by not making them different from other animals. Each animal always was and always will be uniquely wonderful in their own right.